Research led by The University of Texas at Austin has found that weathered bedrock can store a significant amount of rock moisture inside its fractures and pores. This moisture in the layer of weathered rock that is commonly located beneath soils is an important part of the water cycle on the local and global level. 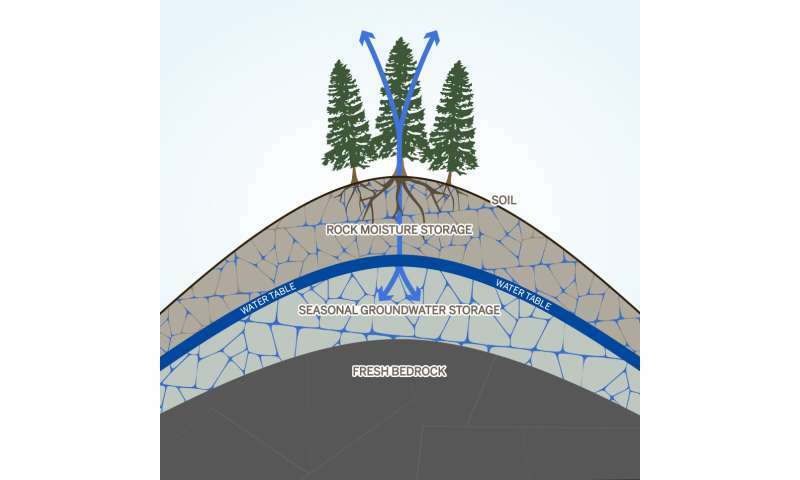 Tree roots tap into the rock moisture and release it back into the atmosphere as water vapor, and water flows through the fractures and becomes part of the seasonal groundwater storage (blue arrows). Credit: University of Texas at Austin Jackson School of Geosciences. Research conducted by The University of Texas at Austin and University of California, Berkeley has found that a little-studied, underground layer of rock can hold significant amounts of water that may serve as a vital reservoir for trees, especially in times of drought. The study, published in the journal PNAS on February 26 looked at the water stored inside the layer of weathered bedrock that commonly lies under soils in mountainous environments. This transitional zone beneath soils and above groundwater is often overlooked when it comes to studying hydrological processes, but researchers found that the water contained within the fractures and pores of the rock could play an important role in the water cycle at the local and global level. "There are significant hydrologic dynamics in weathered bedrock environments, but they are not traditionally investigated because they are hard to access," said lead author Daniella Rempe, an assistant professor in the Department of Geological Sciences at the UT Austin Jackson School of Geosciences. "The study was designed to investigate this region directly." Researchers found the water within the bedrock has the ability to sustain trees through droughts even after the soil has become parched. 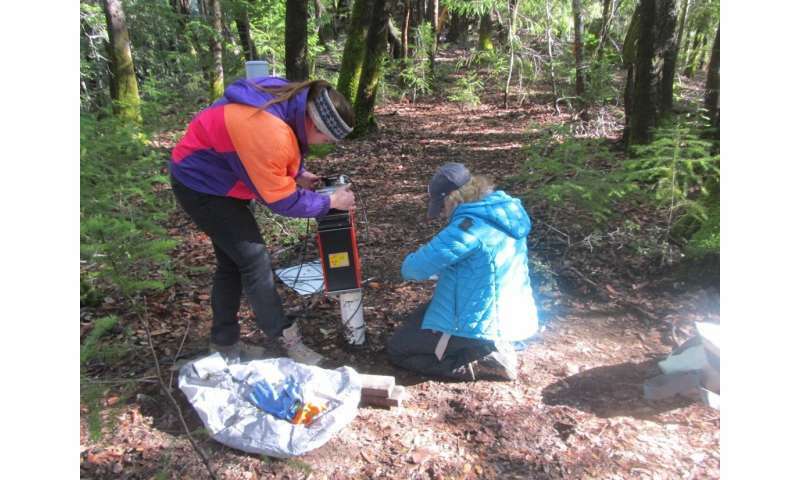 At the field site in Northern California's Mendocino County, scientists found that up to 27 percent of annual rainfall was stored as "rock moisture," the water clinging to cracks and pores within the bedrock The impact of rock moisture will vary depending on the region and topography, but researchers said it likely explains how the trees in the study area showed little affect from the severe 2010-2015 drought that killed more than 100 million trees throughout California. "How trees can survive extended periods of severe drought has been a mystery," said Richard Yuretich, director of the National Science Foundation's Critical Zone Observatories program, which funded the research. "This study has revealed a significant reservoir of trapped water that has gone unnoticed in the past. Research of this kind can help greatly in managing natural resources during times of environmental stress." To conduct the study, researchers monitored the rock moisture from 2013-2016 at nine wells drilled into the weathered bedrock along a steep forested hillslope. They used a neutron probe, a precision tool that measures the amount of water in a sample area by detecting hydrogen. Researchers at the field site using a neutron probe to measure rock moisture inside of a borehole. Credit: The University of Texas at Austin Jackson School of Geosciences. They found that the weathered rock layer built up a supply of 4 to 21 inches of rock moisture during the winter wet season, depending on the well. The maximum amount of rock moisture in each well stayed about the same throughout the study period, which included a significant drought year. It's a major finding that indicates that it doesn't matter if it rains a little or a lot during the winter dry season—the total rainfall amount does not influence the rock moisture levels. "It doesn't matter how much it rains in the winter, rock moisture builds up to the same maximum value," Rempe said. "That leads to the same amount of water every summer that's available for use by trees." The potential for rock moisture to travel back to the atmosphere via evaporation from tree leaves or to trickle down into groundwater indicates that it could have a broad impact on the environment and climate. Zong-Liang Yang, a professor in the Jackson School's Department of Geological Sciences who was not involved in the study, said that the research highlights the need to gather data so rock moisture can be incorporated into climate models. "At present, most, if not all, of global climate and hydrological models neglect moisture stored in rocks," Yang said. "This study fills a critical gap in our understanding." The study provides a glimpse into rock moisture at a small, intensive research site, said co-author William Dietrich, a professor at the University of California, Berkeley. He said the data collected during this study should be a starting point for more research in more places. "The future paths are many," Dietrich said. "We have just one site well-studied... A mixture of theory and field studies will need to be developed to provide regional information for climate modelers."